Carolyn Miller holds a Bachelor of Music Education degree from the College Conservatory of Music at the University of Cincinnati and a Master of Elementary Education degree from Xavier University. She has taught piano to students of all ages for many years, both privately and in the classroom. She also regularly presents workshops throughout the United States and is often asked to adjudicate at music festivals and competitions. Carolyn's music teaches essential technical skills, is remarkably fun to play, and appeals to both children and adults. Many of her compositions appear on contest lists, including the NFMC Festivals Bulletin. Well-known television personality Regis Philbin performed her "Rolling River" and "Fireflies" in 1992 and 1993 on national television. In her church, Carolyn directs a large choir and plays piano for special services. 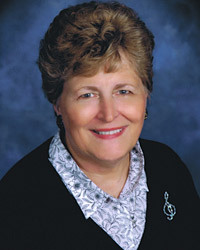 She enjoys spending time with her family and especially her seven grandchildren, for whom she has composed seven solos.